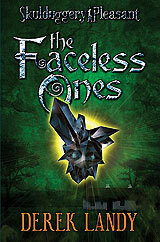 Book review: "Skulduggery Pleasant: The Faceless Ones"
This review first appeared in Turbula in October 2009. It also ran in the North County Times. Seeking a piece of the post-Hogwarts world of children's and young adult fantasy lit, Irish author Derek Landy has crafted a charming new series built around a supernatural crime-solving duo, only one of whom is still alive. The living half of the team would be Valkyrie Cain, Irish teenager who inherited her uncle's manor when he died. It was only after she acquired the manor that she learned it came with one Skulduggery Pleasant, skeleton detective. And that with her uncle's demise, Skulduggery was in need of new assistance. Now in its third volume, The Skulduggery Pleasant series finds our two heroes continuing their battle  only partially successful  to keep the much-feared Faceless Ones from returning to our dimension to wreak havoc and enslave humanity. The books are a fun read, suitable for older children and teens. There's some scariness involved, and quite a bit of suspense. But they're not of the same depth as the Harry Potter series by J.K. Rowling. Rather, Landy's series would be better compared to Eoin Colfer's Artemis Fowl series (which also features an Irish teenage protagonist). The character development and internal conflict that elevated Rowling's series to literature for so many readers simply isn't here in Landy's books. Like the Artemis Fowl series, the Skulduggery books race along the surface. They're more action-oriented than the Potter books, less introspective, less thoughtful. But with Cain's growing mastery of her magical skills, and Skulduggery's consistent refusal to let social niceties play any role whatsoever in his life (and with Landy's own growing mastery of witty dialogue), this is a series that will grow on you. And with a cliffhanger to end all cliffhangers, readers of the series will already be looking forward to next year's fourth installment.